This 13-day circle drive from Calgary offers a wide range of soft-adventure activities as you move through endless mountain ranges. This region is renowned for the glorious wilderness beauty and adventures which are highlighted in this Self-Drive itinerary with visits to Canmore, Moraine Lake, Jasper, Blue River, Kamloops and Golden before its conclusion back in Calgary, Alberta. The selection of activities in each location will thrill any who love the great outdoors, including caving, canoeing, whitewater rafting, a river safari, guided horseback riding, jet boating and a gondola ride. In addition, the flexibility offered by touring with a rental vehicle allows for you to go at your own pace and on your own schedule with no hassles. Arrive in Calgary and collect your rental vehicle for your journey to Canmore. Journey time to Canmore is approximately one and one-half hours. If you are arriving from an international flight or in the late evening we suggest you overnight in Calgary prior to commencing your journey. In the heart of the spectacular Bow Valley and along the shores of the Bow River you will find Canmore, one of Alberta’s best-kept secrets. Check into your Private Luxury Chalet at the Mystic Springs Chalets & Hot Pools for your lodging. Here, at this intimate boutique resort you will receive genuine service surrounded by stunning mountain vistas. Overnight at Mystic Springs Chalet & Hot Pools. Today you will have the opportunity to get off the beaten path and explore the Canmore Caves. Be treated to a four and a half-hour fully guided cave explorer tour and learn the natural history of the Canmore Cave formation, geology, plants and animals. Discover the caves undisturbed and in their natural state offering a true spelunking experience. Overnight at Mystic Springs Chalet & Hot Pools. Your journey to Moraine Lake takes you through spectacular scenery with many recommended stopping places, including Lake Louise. Depending on where you stop your journey could take two hours or a whole day! Cradled by the majestic Rocky Mountains, Moraine Lake offers an astounding image of peace and tranquility in nature. Here you will be pampered during your stay at Moraine Lake Lodge. This post-and-beam structure graced with grand windows provides generous views of the lake, with its incomparable turquoise hue, and the surrounding Valley of the Ten Peaks. Overnight at Moraine Lake Lodge. Today you will have a great selection of activities that would thrill any outdoorsmen including canoeing, hiking, sightseeing and fishing. 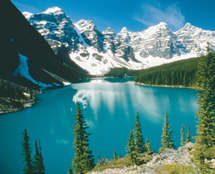 Fill your day with exciting activity and soak up the adventurous spirit of Moraine Lake. Overnight at Moraine Lake Lodge. Travel to Jasper Lake via one of the most scenic highways in the world, the Icefields Parkway. Spend time at Peyto Lake, Bow Lake, Athabasca Falls and Sunwapta Falls. At the Columbia Icefields you will have the opportunity to ride on an Ice Explorer (not included) to the middle of Athabasca Glacier. With sightseeing stops, we recommend allowing 10 hours for today’s drive. Nestled on a terraced hillside, every room at Pyramid Lake Lodge offers a panorama of Pyramid Lake and the Canadian Rockies. Exceptional dining, well-appointed rooms, and numerous on-site amenities will make your stay a pleasurable one. Overnight Pyramid Lake Lodge. Today enjoy the thrills of a whitewater rafting tour on the Athabasca River, with trips available for all ages and abilities. All the necessary equipment is provided, including wet suits, booties, life jackets and paddles. The rest of the day is free to explore Jasper National Park with your rental car. Among the highlights are Pyramid and Patricia Lakes, Maligne Canyon, Miette Hot Springs, Maligne Lake and the Jasper Tramway. The excellent National Parks office in the centre of Jasper will be able to provide you with ideas and suggestions. Overnight at Pyramid Lake Lodge. Today’s journey is a short one, past Mt. Robson and along Highway 5 to Blue River where you will be staying in an exclusive and comfortable private chalet at Mike Wiegele’s Lodge. Combined with breathtaking views of Eleanor Lake and the surrounding Cariboo and Monashee Mountains you will wish you could stay forever. Overnight at Mike Wiegele’s Lodge. Today you will be treated to a River Safari. Board your specially designed watercraft and prepare for an action packed one-hour narrated River Safari in the Canadian Wilderness. Travel 12 kilometres along the Grizzly Bear Valley where you will view wildlife in their natural habitat. Take a short walk to view a scenic waterfall and glacier fed lake. Overnight at Mike Wiegele’s Lodge. Continue your journey south along the scenic Yellowhead Highway 5 to Kamloops and allow approximately three hours travel time. Arrive in Kamloops, the heart of British Columbia’s interior. Boasting the warmest weather in Canada, world-class sporting facilities and incredible recreational experiences, Kamloops has a great deal to offer. Check-in for your two-night stay at the South Thompson Inn Guest Ranch, a Kentucky-style inn offering western hospitality. To round out the country atmosphere you will find an equestrian centre on the property. In keeping with the equine theme, the rooms are named after racehorses, racetracks, and Kentucky cities. Overnight at the South Thompson Inn Guest Ranch. Today you will have a choice from a two-hour horseback ride or, alternatively, if you are just looking to relax you may choose the spa rejuvenation package. Overnight at the South Thompson Inn Guest Ranch. Join Highway 1 heading east to Golden. Drive the scenic Rogers Pass with spectacular views of the surrounding valleys. Gorgeous scenery, crisp, clear mountain air, and some of the most splendid and awe inspiring scenery in the world are at your doorstep in Golden. Arrive at your leisure and check-in to the Copper Horse Lodge. Let these lush mountain surroundings be your home base for relaxation and adventure. Overnight at Copper Horse Lodge. Today you will be treated to a full day of adventures. Join the Canyon jet Safari for an exhilarating jet boat adventure on the Columbia River to discover the wilderness and wildlife found in this region. Enjoy your pass on the Golden Eagle Express Gondola to the mountain summit where you will enjoy the "Sky Lunch" at the Eagle Eye Restaurant. Overnight at Copper Horse Lodge. Travel by car West along Highway 1 to Calgary where your vacation ends with the return of your rental vehicle. Please allow a driving time of four and a half-hours.